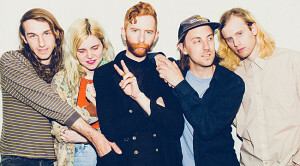 When Saintseneca inked a deal with ANTI- Records, the indie folk band had already started to record what would become its next album, Dark Arc. But with some assistance from the label, the group was able to finish the album with Mike Mogis (Bright Eyes, The Faint, Rilo Kiley). That experience was such a positive one, Saintseneca recruited Mogis to produce its new album, Such Things. The band utilizes a range of instrumentation, including balalaika, mandolin, dulcimer, Turkish bağlama and floor percussion. Singer-songwriter and multi-instrumentalist Zac Little called from “somewhere in upstate New York” to talk about the album. You’re originally from Noble County in Ohio. What was it like growing up there? I suppose it’s a pretty remote area. I grew up on a farm. I always felt an inclination toward music. I didn’t have a pivotal moment or something that made me gravitate toward it. From the time I was a little kid I was making up songs and stuff, just dumb little things. I started skateboarding when I was a teenager and that got me interested in weirder music and cultures that are outside of the norm. Being opened up to that, even though I was living in a remote area, gave me a connection to the outside world too. I became more interested in writing songs and playing in a band. I always liked the Ramones. That was my first favorite band. Rather that going down the trail of punk bands, shortly thereafter I got into the Beatles. That ended up being the most pivotal musical moment for me. For a lot of people, you hear that music and it’s either too early or too late. You think it sounds corny or something like that. I feel like it was fertile soil for me. It was the right moment to have my mind blown. Ever since then, that’s been my No. 1. The band formed nearly ten years ago. Talk about how it came together. It started out with some people that I grew up with. We played in bands together in high school. We moved to Columbus, and it went from the rock band thing we did in high school to a way to incorporate these other instruments. I had picked up a mandolin and dulcimer and things like that. We started out in an acoustic-y bluegrass formation. Now, it’s turned back into a rock band all those years later and come full circle. From being involved in the music scene in Columbus, I have met other people who eventually joined the band. Was it difficult to learn to play those instruments? I wouldn’t portray myself as an expert on any instrument. I just hack my way around on a bunch of stuff. I learned guitar first and was self-taught on that. I applied a similar mentality to learning more and more. After you learn four or five things, you begin to recognize the commonalities between them. I picked it up pretty fast. For me, it’s more of a tool for writing songs and stretching my mind across the different territories. The band signed to ANTI- Records in 2013. You recorded Dark Arc at ARC Studios in Omaha, Nebraska with producer Mike Mogis. What was that experience like? That was a really exciting moment. They’re great to work with and I’m a big fan of artists on the roster. It was an exciting thing that came together. We made Dark Arc ourselves and they liked it a lot. They wanted to release it and after the fact. We were able to keep recording that record with Mike Mogis and we worked again with him on the new album. The label introduced us to him. That was a direct outgrowth of working with the label. You’ve said the new album is about consciousness. Talk about that. It’s about consciousness and physics. It’s about the intersection of those two fields. It’s about meditating or thinking about the existence of thoughts and what manifestations they have as physical things. On the most fundamental level, it’s about chemical fluctuations in your head and the resemblance that might have. I was reading a lot about it. I wanted to make a pop record about it. What piqued your interest in the subject matter? I always liked science. I went to college for art. I started to do my own research because it seemed like a fascinating field. That intersection of neuroscience and physics is a big frontier and question for this era. I think it’s an exciting time to learn about that kind of stuff. There are certain philosophical implications for it as well and that’s maybe what I’m thinking about in terms of pop songs. Talk about the sessions of the new album. We recorded with Mike Mogis in Omaha. We finished Dark Arc with him. I thought it would be fun to do a record like that from scratch. That was exciting. I would say it was a little more rigorous. Last time, we had over a month to do a record that was done. This time, we went in with an excess number of songs. We had five weeks from start to finish. That might seem like a lot of time and it is but there’s so much to do and with a project like this record. That was ambitious. It was more rigorous but I enjoyed it. I really like the vocal performance on “Estuary.” Was that a once and done session or did it take some time to get it right? I don’t know. That was pretty easy. We have the basic tracking done. I wanted to start fundamentally with the vibe of a band playing the songs in a room and then expand on that where it seemed interesting or appropriate. We just play the songs. That was a song that I thought we could cut. Everyone else really liked it so we kept it. It sounds a little out of sync with the other songs but I like that. Conceptually, that’s what I’m thinking about. I want everything to be relevant to the rest of the record. Talk about the arrangement of “How Many Blankets are in the World?” It’s a really sparse song. What were you going for sonically? I had done a demo of that song that was similarly sparse. It felt like it worked. I just sat down and played the song, and it was done. It felt complete in that state. Personally, I like to have that wide spectrum of songs on an album. I like to have a wall of sound where you don’t place any constraints upon yourself in terms of what you’re going to track. And I like to do other things where you use those constraints to respond creatively. That one felt like it worked that way. Is “River” about one particular river? It’s more a metaphorical thing. It ties to “Estuary” in terms of a water cycle thing. It’s a metaphor for individuality giving way to a broader sort of ocean. And “Lazarus” is about the guy who rose from the dead? At least partially. It’s a mysterious and intriguing story. I wondered about the logistics of that kind of thing. If one were to die and then be raised from the dead, what would it feel like? Would you feel good or would you be hungover? Would you be tired or would your body feel the same? I think that relates to the themes of consciousness and how they manifest themselves in the physical world. The band is often described as a folk group. Do you feel that’s apt? No, but I don’t care. I get it. To be fair, the band started out as almost a bluegrass band. It was like writing pop songs through that idiom. People still think that about us because that’s what we started out as. I don’t want any limitations placed upon me. I don’t care, I’ll still play a bluegrass song and I enjoy it if it’s an inspiring medium through which to write a song. I think it’s fun to add a bass drop and drum machines. Most fundamentally, I don’t want to feel as if something is off limits. The new songs are really fun to play so I’m excited to play them.